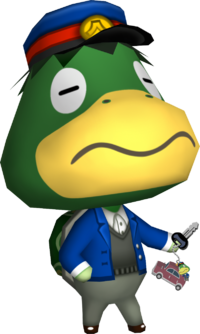 Official artwork of Kapp'n from Animal Crossing: City Folk. Kapp'n (かっぺい, Kappei, known as うんてんしゅ Driver in the Japanese versions of Wild World and City Folk, as well as Super Smash Bros. Ultimate) is a character from the Animal Crossing series. Kapp'n is a sea-faring kappa, though he is occasionally referred to as a turtle. His first appearance was in Dōbutsu no Mori+ for the Nintendo GameCube, which was later localized as Animal Crossing. He would ferry players to their town's local island as long as a Game Boy Advance was connected via Link Cable. Along the way, he would sing shanties, make wry comments, and flirt with female players. This started a trend of Kapp'n transporting players to new places: in Animal Crossing: Wild World, he shuttles the player into town through taxi, while in Animal Crossing: City Folk, he drives a bus to and from the player's local city. In Animal Crossing: New Leaf, he returns to his original role of ferrying players to the local island. New Leaf also introduced his extended family: his wife, Leilani; his daughter, Leila; and his mother, Grams. His appearance as an Assist Trophy in Ultimate is based on his appearance in Animal Crossing: City Folk where he would take the player to the City by bus. Kapp'n appears as a trophy and a sticker in Brawl, using his appearance from Animal Crossing: Wild World. He can also appear in the crowd in Smashville. Additionally, his taxi appears in the background of the same stage, as well. Kapp'n and Donkey Kong in Super Smash Bros. for Nintendo 3DS. In Super Smash Bros. for Nintendo 3DS, Kapp'n appears as a background character in the Tortimer Island stage, now using his appearance from Animal Crossing: New Leaf. He drives his motorboat, creating a temporary platform on either side of the stage. In Super Smash Bros. for Wii U, Kapp'n makes a cameo in the Town and City stage, driving the bus from his Animal Crossing: City Folk appearance. Once again, he can appear in the background of the Smashville stage and his taxi from Wild World can also be seen in the stage. The Kapp'n trophy is exclusive to the 3DS version. This turtle ferries you out to the tropical island. In the past he's been seen driving a taxi and a bus, and now he's the captain of a little boat. Or maybe he just wanted to sing his songs— it's only right to be sailing while singing sea shanties, after all! Kapp'n is a man of many talents: taxi driver, bus driver, and now sailor of the boat that takes tourists to Tortimer Island. He loves taking people places, no matter what the method, but now he's back to his roots. You might assume that his favourite letter is the letters arrr, but you'd be wrong: his one true love is the C.
Kapp'n as an Assist Trophy in Ultimate. In Super Smash Bros. Ultimate, Kapp'n debuts as an Assist Trophy. When summoned, he will get in his bus and drive it across the stage, turning around at edges and occasionally jumping the bus up into the air. Any fighter hit by his bus will get trapped inside, after which Kapp'n will drive it towards a blast line, potentially causing an OHKO. Any player caught inside can mash buttons to escape, after which Kapp'n will resume driving erratically across the stage, potentially capturing another player. As with other items that grab the player and carry them away like the Beetle and Boss Galaga, the higher the damage the captive has, the more difficult it will be to escape. Training Mode describes his Assist Trophy: Takes opponents who are hit by the bus off of the screen. Can't be KO'd. He also reprises his appearances in Smashville, Tortimer Island, and Town and City. Official artwork of Kapp'n from Ultimate. Kapp'n driving off with Donkey Kong on the Bridge of Eldin. Kapp'n driving away from Zelda with Donkey Kong on Temple. This page was last edited on April 8, 2019, at 16:48.